has one month per landscape A4 page with days running horizontally. and the 12 monthly planners together make a 2012 Calendar. You are very welcome to download them free. is in Word format so it's easy to change to your favourite colours or change the size to A3 or A5. The 2012 calendar shows 2012 Public Holidays in England. You can download each month separately or download the whole 2012 calendar in one go. 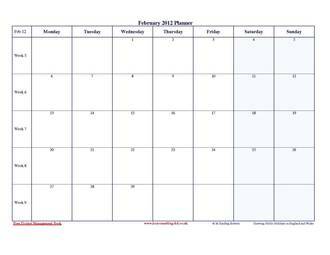 This 2012 Calendar monthly planner, weekly planner, daily planner has one A4 page for each month in 2012. So January, February, March, April, May, June, July, August, September, October, November, December 2012 month planners comprise this 2012 calendar. Each month's page of this 2012 Calendar has one row per week showing the week numbers. Bind these 12 monthly planners together to form a calendar for 2012. Download this free 2012 calendar.